My husband loves to cook. He likes looking up new recipes and trying them out. That is why we love "How to Entertain Like a Gentleman." This cookbook focuses on a male-centered approach to cooking. You will not find flowery photos and frilly instructions. The cookbook is made "manly" by giving more direct instructions and giving titles that make the items seem more "masculine." My husband enjoys the cookbook, and I like that he is inspired to cook! 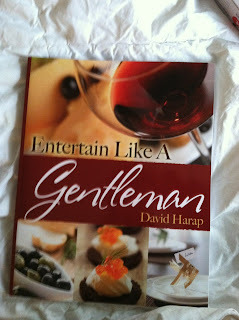 I received a copy of the cookbook to review here on MamaBreak. I did not receive any other kind of compensation for my review. As always, my opinions and experiences are my own.